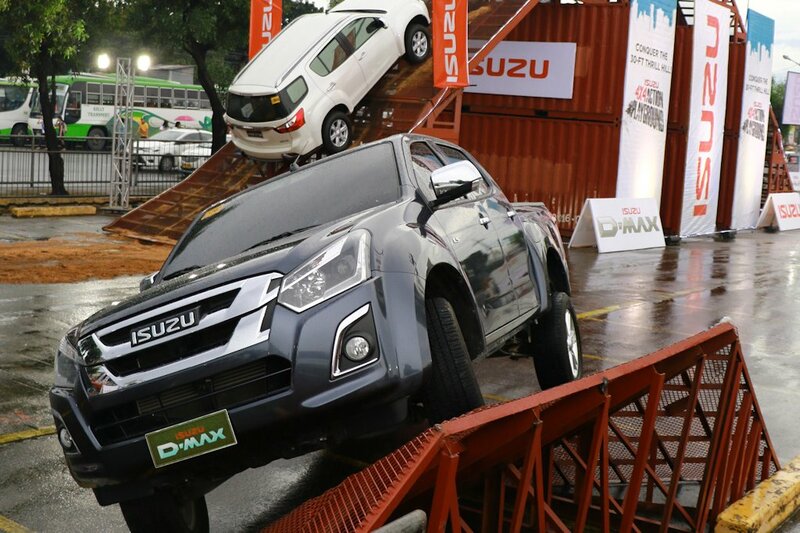 After three highly successful and fun-filled legs Isuzu Philippines Corporation’s four-wheel driving demonstrations returned to Metro Manila for its last installment this year. Held last November 25 to 27, 2016 at the grounds of SM Fairview in Quezon City was the Isuzu 4x4 Action Playground, which offered off-road driving enthusiasts and mall goers a chance to check out the capabilities of Isuzu vehicles at tackling extreme terrain. To let the public experience the unrivalled four-wheel drive performance of Isuzu vehicles, two units each of the Isuzu mu-X 4x4 LS-A and Isuzu D-MAX 4x4 LS were offered up for test-drive demonstrations over a specially prepared course. Lined up on this unique track were obstacles designed to test the limits of the vehicles. These obstacles included the slipper slope, articulation ramp, 40-degree transverse-angle ramp, and the centerpiece – the 20-foot Thrill Hill. ”The urbane and sophisticated exterior styling of the Isuzu mu-X and Isuzu D-MAX, especially with their latest upgrades, may lead many people to overlook the fact that these two models’ 4x4 variants are highly capable vehicles that can take on any terrain and obstacle. By letting consumers witness and experience first-hand these capabilities in a controlled environment, like in the Isuzu 4x4 Action Playground, we can better inform them of the unmatched qualities of Isuzu vehicles,” IPC Senior Vice President Arthur Balmadrid said during the event’s opening. Making the outdoor activities more exciting were games held every two hours that guests played onstage, booths that displayed a variety of accessorized Isuzu vehicles and standard models, plus a service caravan that offered a special 30 percent discount on parts and 20 percent on labor charges, as well as general repairs and light PMS on customer vehicles. A booth for Isuzu merchandise was also set up. Customers who registered for the discounts on Isuzu-supplied parts, lubes and accessories can avail of the items at all authorized Isuzu dealerships in Metro Manila and Bulacan any day between November 25 and December 31, 2016. Apart from the thrills provided in the 4x4 Action Playground and by the other activities, more attractions were available inside the SM Fairview mall, which were held from November 23 to 29, 2016. Guests who inquired on Isuzu models were given the chance to play Pachinko and the slot machine, where they received prizes. A giant Jengga was also put up for all guests to enjoy.